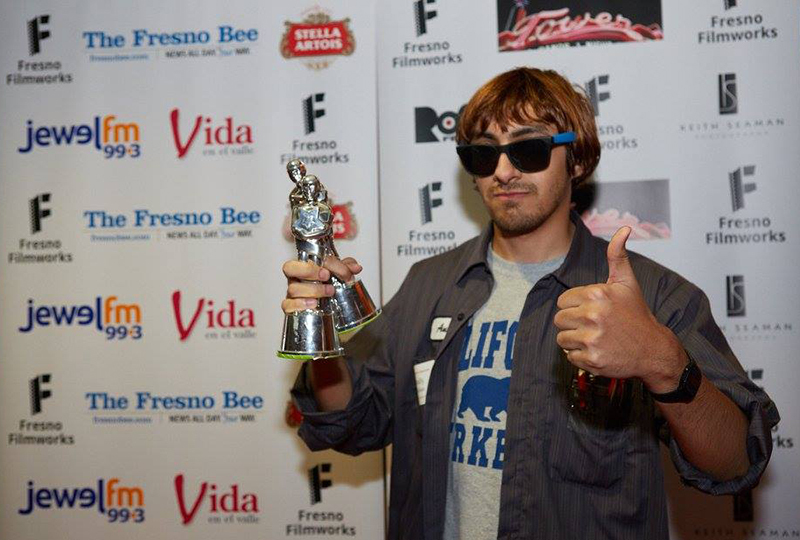 The Academy would like to thank aspiring filmmaker Andy Julian for his volunteer time with Fresno Filmworks. At age 24, Andy is a one-of-a-kind Renaissance Man — although he wouldn’t call himself that because he doesn’t like drawing attention to himself or his accomplishments. Andy moved to Fresno from Palo Alto in 2004. He’s an artist, a musician, and an aspiring filmmaker, and he likes to work with his hands. He serves as president of the Volunteer Club at Fresno City College. And he will soon graduate from FCC and become a film studies major; he is applying to UC Berkeley, UCLA, and USC. Occupation: As a full-time student, Andy doesn’t have a whole lot of free time. He enrolled at Fresno City College in January 2015, and he took 19 classes in his first year, equalling 63 units. In his free time, Andy works out, plays guitar, makes name badges for his own work shirts (even though he’s not in construction currently), takes film and photography classes, and serves as an audio engineer for the Latin jazz class at Roger Rocka’s. This February was special for Andy, as he visited UC Berkeley to meet with an adviser for his dream program: a film studies program that would let him not just critique films, but create them. He has visits to UCLA and USC lined up as well. How did you get started with Fresno Filmworks? John Moses, president emeritus of Filmworks and film studies instructor at Fresno City, suggested that Andy — and all of his film studies students — attend a screening of “the mystical and mythical Fresno Filmworks premieres,” Andy says. Andy enjoys franchise films like “Star Wars,” “Back to the Future,” “Toy Story,” and “The Avengers,” but he also has developed a taste for truly cinematic, transformative experiences. That’s why “La Jetée,” a 1962 French science-fiction film by Chris Marker and winner of the Prix Jean Vigo for short film in the Cinema of France, is his favorite. Constructed almost entirely from still photos, the black-and-white film tells the story of a post-nuclear war experiment in time travel. Who are some of your favorite directors, or what are some films you’d like to see at the Tower? He likes Werner Herzog and “Grizzly Man.” He likes Krzysztof Kieślowski documentaries and Polish feature films. And one of the films that was on the Cutting Room Floor for Filmworks in March, “Hitchcock/Truffaut,” are among those Andy appreciates. “Oh, and of course, Martin Scorsese,” he says. Fresno Filmworks thanks our February 2016 Volunteers: Hazel Antamarian-Hofman, Cleo Bauer, Frank Dougherty, John Dunning, Richard Flores, Janelle Gaxiola, Trin Gibney, Megan Ginise, Karen Hammer, Neal Howard, Andy Julian, Richard Markley, Ann McGowan, Conde McGowan, Steve Ohanesian, Kristy Page, Dominic Papagni, Angad Puniani, Andrew Ranta, Gene Richards, Jon Veinberg, Olga Verkhotina, Suzanne Watkins.